Details of the sightings have been reported to the National UFO Reporting Center (NUFORC), based in the US, which investigates and records such sightings. 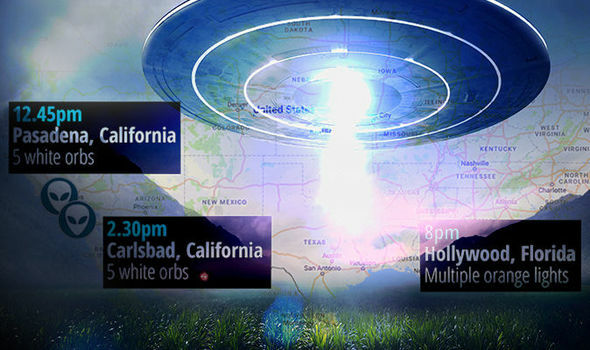 One incident happened at 12.45pm in Pasadena, California, when at least five “circular UFOs” were seen. The unnamed witness said in a report to NUFORC: “My cousin went outside to throw away the trash after we finished eating breakfast. “He then returns and tells everyone that their are UFO’s outside. “I thought he was joking but his wife went outside to look first my wife followed and then my kids and I followed. “I looked up and in the sky I saw shiny dots in the sky. I observed the objects and then returned inside to get my iPhone to document what I saw. The witness later saw a father and son, and showed them the objects in the sky. He said: “I asked if they looked like drones. He replied, ‘No Way’. 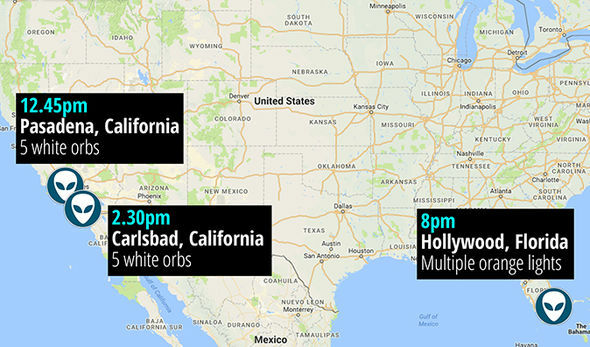 Groups of UFOs were seen over three US locations the same day. “I observed planes in the air and compared them to what I saw and the objects were much higher. “The objects seemed to hover and remain still. One was slowly moving as the others remained still. NUFORC said: “Seven observers witness a cluster of at least five tiny white objects that hovered almost motionless in a clear, cloudless sky, for approximately an hour. “High-quality video footage of the event accompanied the written report. Express.co.uk showed the video to Scott Brando, who runs debunking website Ufoofinterest.org. He said he believes they were just a group of helium balloons that had been caught on the wind and were slowly rising away. The second sighting was at 2.30pm, also on January 13, about 90 miles to the south in Carlsbad, California, when five oval or circular orbs were seen. The witness was testing out new binoculars. He wrote to NUFORC: “While I was scanning some edges of a few clouds and some contrails looking towards the west over the ocean around 2.30pm, I noticed one very outstanding whitish looking object, between egg and football shaped but sometimes looking more round and other times having more of a top shape. The cases are being investigated by NUFORC, but Scott Brando says they were balloons and lanterns. “I had to assume that possibly the changing viewing angle had something to do with shape change although at times the object seemed to either be vibrating or rotating. “That object suddenly appeared and was very slowly moving towards the ocean and back nearly directly overhead just above where I live. “As I continued watching I noticed another object moving very slowly, coming directly out of the setting sun direction and moving very slowly in direct horizontal line towards the first object in what looked like a collision course. “These objects went from a white colour to sometimes a shimmering metallic or reflective mylar look but it wasn’t solid looking when it began shimmering it seemed to flash as if it had multiple surfaces. “As I continued to view the two objects I watched a third that seemed to drop down from above my focus to an altitude similar to the other two objects and north of them again the three manoeuvred back into a horizontal line with quite a bit of distance between each other. “After that manoeuvre, they then broke the line and moved closer to form a triangular formation and slowly moved out towards the ocean and then back towards my viewing position. Then, at around 8pm the same day more than 2,000 miles away in Hollywood, Florida, there was another sighting of “numerous orange lights above the coastline,” by a law enforcement officer. The witness said simply: “Numerous orange lights observed moving slowly above the ocean from north to south. NUFORC was also sent video. Chinese lanterns are often mistaken for UFOs as they drift in groups before disappearing as the internal flame goes out. Mr Brando said the second sighting in Carlsbad was likely to be the same helium balloons travelling south. He believes the objects seen in Florida were Chinese lanterns and unrelated. That’s No Moon — It’s an Alien Observatory Created to Keep an Eye on Us! He “believes” they were balloons. A “belief” like that is as scientific as “believing” in the tooth fairy. Debunkers must think we’re all just stupid. WAS EZEKIEL DESCRIBING EXTRATERRESTRIAL VISITORS IN THE BIBLE? Remember EATR, the Military Robot That Was Supposed to Eat Humans?